Wait - that's not an Apple Store. Phones 4U is gearing up to open 15 new stores in the UK, all with the Samsung name on them, a move that could see the smartphone giant take on rival Apple Stores. 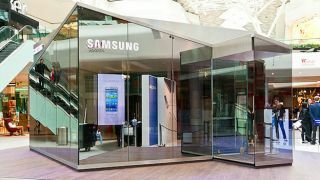 The new stores will be staffed by Phones 4U employees, but will pack Samsung-branded devices, according to Mobile News. Scott Hooton, chief marketing officer at Phones 4U, told the site that the first 15 stores will feature Samsung phones, computing accessories and wearable technology. It's not yet clear where in the UK the new stores will be located. The deal is a significant expansion on an existing contract between the two companies for a Samsung-branded Phones 4U store in the Westfield Stratford shopping centre. Phones 4U also ran some temporary Samsung stores during the London 2012 Olympics. Samsung appears to be wanting to expand big time to the high street. It recently inked a deal with Carphone Warehouse for 60 branded stores throughout Europe, between 10 and 15 of which will be in the UK and will open in April. In December it also grabbed Tim Gudgel, the designer who worked on the Apple Stores, in what could not be a more obvious attempt to steamroll in on its territory. Apple has 98 stores in Europe, 37 of which are in the UK. Samsung's move will quickly give its long-standing rival a run for its money. With Apple Stores making more money per square foot than any other retail chain in the world, it is no surprise that Samsung wants a piece of the action. What are the next trends in mobile technology?